I have set new year goals for most years of my adult life. The years that I did not set goals, I thought that I probably would not follow through or that I should be setting goals more consistently anyway, not just at the beginning of the year. However, when I have set annual goals, I have mostly found them to be helpful especially when I review them regularly throughout the year and keep track of my progress. Aligning goals to an annual timeframe helps me reflect over longer periods of time than I think I normally would. In 2017 my goals were mostly uninspiring. I only fully completed about 30% of my goals and about 50% of them I didn't complete at all. The rest were only partially completed. Toward the end of the year, I realized that they were uninspiring to me because I did not do a good job of aligning my goals with my governing values. For me, it has not always been easy to identify my own values. Benjamin Franklin famously had his 13 virtues which he wrote when he was 20 years old. He originally started with 12 but added humility as a 13th later. Unlike Franklin, mine have evolved more dramatically over time. For instance, I add new ones as I reflect on what I enjoy doing and thinking about. Sometimes I combine a few similar value-statements into one to simplify my list. Other times I remove a value-statement from my list because it was something that I thought I should value, but ultimately was not very passionate about. At the beginning of this 2017, I had 11 value statements in my “official” list. A recent revision left me with only 7. I have added the worksheets that I made for myself on my Downloads page. You can print them out and keep use them for your own value and goal setting activities. Why don't Americans save more? Working allows us to leave our parents and live on our own. It allows us to be independent. I will call this the first independence. If we work hard and invest our savings we can accomplish independence from having to work. This is the second independence. It is often called financial independence. The graph below shows a standard time frame for when we are dependent on parents, independent through work, and independent from work. If you want FI by age 50, you first need a plan that will get you there by 70. It is more difficult to achieve FI at younger ages. Therefore, a retire-at-70 plan must precede a retire-at-50 plan. Increase your chances of an early FI by thinking about these things now and studying people who have achieved early FI. The purpose of this post is to show how to maintain one's lifestyle after he/she stops working. Observe the chart below (Source here). It shows the advantage of continuing education past high school. 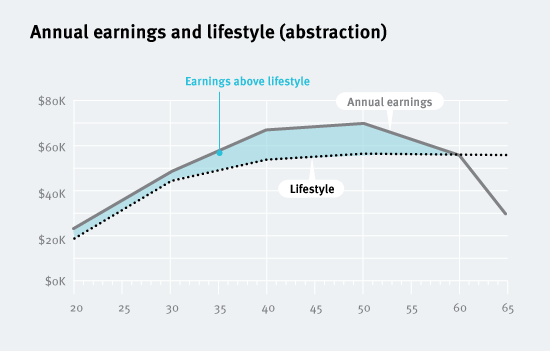 It also shows that in the course of a lifetime one’s salary will tend to rise until about 40, it will rise a bit slower from 40 to 50, then it will plateau and slowly decline. They would borrow when they were young and pay off the loan when they are older. If they spent the rest of their income on lifestyle, then they would be in big trouble when they approach retirement years. They would be forced to decrease their lifestyle and possibly become dependent on others as there annual earnings decreased. To avoid this, they would have to save, by consuming less than they earn as shown in the graph below. For simplicity, let's assume that they didn't have to take out any school loans. If one saved and put their money into investments, he/she could create an income from their investments that would replace their annual earned income that they had to work for. The only way to maintain independence and increase one's lifestyle over time is to consume less than you earn and put your savings into an investment that will grow and provide income without having to work. After paying your tithing of 10 percent to the Lord, you pay yourself a predetermined amount directly into savings. That leaves you a balance of your income to budget for taxes, food, clothing, shelter, transportation, etc. It is amazing to me that so many people work all of their lives for the grocer, the landlord, the power company, the automobile salesman, and the bank and yet think so little of their own efforts that they pay themselves nothing. There are religious and secular reasons to give to charity. A study done by the economist Arthur Brooks found that after accounting for variables, those who give to charity tend to make more money as a result of their giving. In other words, if you take two people that have the same religion, income, career, and education and track them over time, the one that gives to charity actually makes about $14,000 more on average than the non-giver. I will write more about charity in the future. 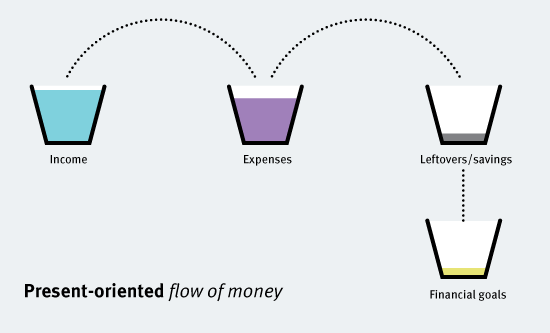 In conclusion, it is more difficult to save when expenses take priority over financial goals. Saving only seems to work if you get into the habit of paying yourself before your other expenses. So follow the example of the wealthy and start saving today. In my last post I showed that most Americans wish they had saved more before they had to retired. Despite that fact, savings rates have been dropping in the United States. The graph below shows the U.S. savings rates in black. The savings rates of Japan and Germany are shown for comparison. Europeans tend to save much more than Americans, and some reports claim that the Chinese save close to 25% of their income. The sources of this data come from the OECD 2011 Factbook. It can be found in a cool interactive graph here. The data isn't perfect because it sometimes counts automatic 401K contributions as expenses instead of savings. But, most economists believe that the general trend is correct. Here are a few possible reasons why the U.S. savings rate is so low. (1.) Median household income has been stagnant in the past 10 years and new and attractive goods and services such as iPads and fun vacations entice people to spend more and save less. I guess this is what is often referred to as consumerism. (2.) Americans sometimes "save" in the form of human capital. They spend their money on education and earnings ability because they can "always earn more later" with higher skills. (3.) The American tax system discourages savings by taxing investment income and capital gains. According to the economist Steven Landsburg, "The death tax sends a powerful message to rich people: "You can't leave everything to your heirs, so spend now, before it's too late. Burn more fuel. Demand more timber for your mansions, more steel for your private planes, and more fiberglass for your yachts." (4.) It is relatively easy for the poor in America to get a loan if needed. So why save for a rainy day when one can just borrow easily instead? (5.) American's also save in the form of home equity hoping that a future home sale will provide some retirement funds. (6.) And then there is the standard explanation that it seems difficult for people in general to subordinate what they want now for what they want later. Hence, many people tend not to plan for the future and instead live for the present. This is the 'eat, drink, and be merry for tomorrow we die' explanation. Whatever the reason, everyone would benefit from some serious introspection into why they are not saving more. If everyone did this, we would likely have more savings and less regret in retirement years. In my last post I wrote about 3 reasons to save. The first reason is to prepare for rainy days including emergencies or preparing for old age when one cannot work anymore. The second reason is to purchase large items like houses and cars and educations. The third reason is to increase leisure activities like vacations or early retirement. The purpose of this post is to answer the question, "Do Americans save enough?" First, let me define savings. 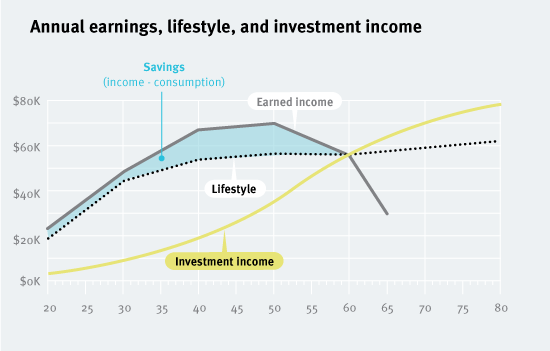 Savings = Income - consumption. If you consume less than you earn, then you have a positive savings rate. If you consume more than you earn then you have a negative savings rate. Negative savings is not categorically bad in every situation. For example, it might make sense for many university students to consume more than they earn by taking advantage of student loans within reasonable limits. According to some recent studies, Americans say they wish they had saved more for their retirement. According to a survey done by the Consumer Reports magazine's National Research Center, nearly a third of all people at or approaching retirement said their expenses were higher than they had anticipated before retiring. Only 11 percent said expenses were lower than expected. Also, a survey commissioned by Bankrate and administered by the Princeton Survey Research Associates International asked both retirees and workers questions about retirement realities and expectations. They found that 55% of respondents said they wish they saved more. According to another survey done by Putnam Investments. 70% of people who already retired within the past 2 to 6 years said that they wish they saved more for retirement and 59% said they wish they saved earlier. So to answer the original question, most Americans say that they wish they saved more and earlier for retirement. Listening to the regrets of the elderly should be a powerful lesson to the young. When you retire, you probably won't be wishing that you saved less. Coming up: Why don't Americans save more?